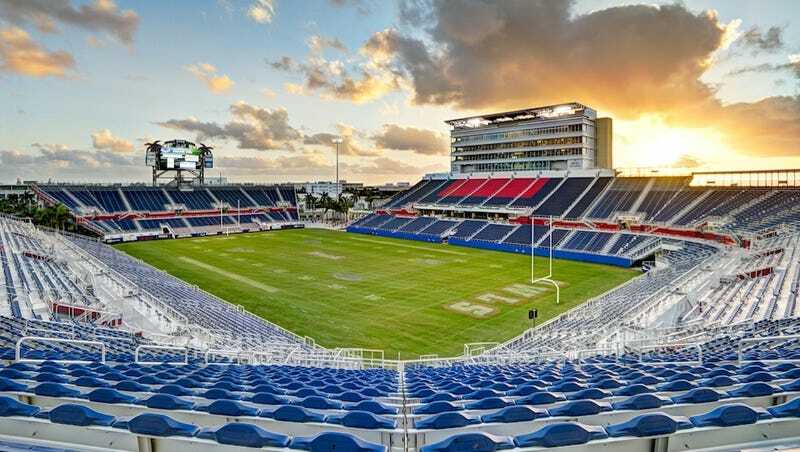 On Tuesday we told you that Florida Atlantic had reached a 12-year, $6 million naming rights deal for its new stadium. The lucky winning bidder was Geo Group, one of the country's largest operators of for-profit prisons, and the target of numerous lawsuits and allegations claiming prisoner abuse. Though it's incredibly appropriate for two of the world's last sources of slave labor to join forces (joke shamelessly stolen from commenter RMJ=H), this was sure to create an uproar, especially in South Florida, a community sensitive to immigration and human rights violations. If you want a full litany of abuse, read the "controversies" section of Geo Group's Wikipedia page. But read it fast: Geo Group is desperately trying to wipe it before you see it. As their naming rights deal became national news, a Wikipedia user named Abraham Cohen attacking the page, clearing the entire "controversies" section and replacing it with, essentially, a PR packet. As first noted by the Huffington Post, Abraham Cohen is a spokesperson for Geo Group, and the new material contained multiple instances of the pronouns "we" and "our." Via SB Nation, here's Abraham Cohen and then-FAU President Frank Brogan in 2007. Two hours after the page had been restored, the corporate information provided by user Abraham Cohen suddenly reappeared in the capsule, posted from an anonymous IP address which claimed the information "accurately reflects the history of the company" and was not "promotional material." The anonymous user's IP address leads to the Geo Group's servers. So here's where we stand. Activists are pushing FAU to bail on the deal. FAU brass is refusing comment to the media. Geo Group is scouring the internet of facts about all the horrible things it's done. FAU has been trying for years to sell the stadium's naming rights, with no success until now. Is $6 million worth being evil?